Update: Thanks to Teksavvy for noting my post. For all those wondering, I haven’t had a second of downtime yet, and my speed remains constantly high. I’m super impressed. Tom, my neighbor suffered from 90 second disconnects once or twice a day. They were annoying, but not horrible. Teksavvy has been rock solid! I’m a fan. So I haven’t had it for long, but I’m pretty impressed with Teksavvy’s cable Internet connection. It looks like I’m going to get what I paid for, and that makes me excited. Tom, my neighbor uses Storm, and while they are a great company as well, and I know someone that works there, the idea of having two different companies providing Internet means that if my Internet does go down, I can borrow from Tom’s until mine comes up, and vice versa. It is a nice little safety feature for those of us that work from our home offices. I had to explain the whole thing to him, and he seemed to think it was a smart answer, and got down to work. He was pretty efficient, and nice. He left before I was able to test to make sure my connection work as I guess provisioning Rogers lines under a Teksavvy account can take a bit of time. About an hour after he left, I was up and running on my own connection. 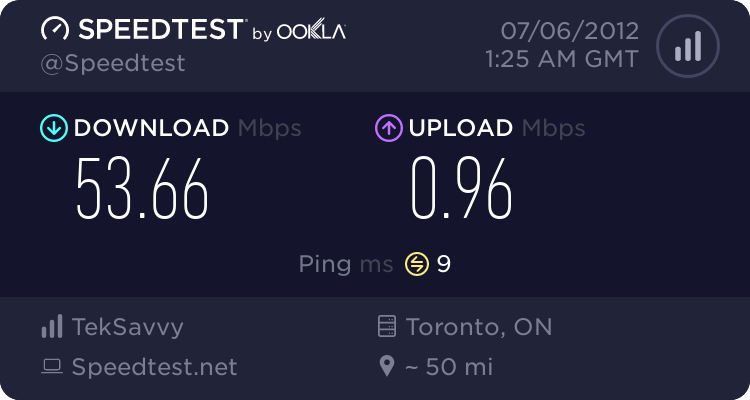 I purchased the 28mbps down, 1mbps up cable connection from Teksavvy, and my tests seem to agree that I’m getting that speed or better. Everything just feels so snappy. The fastest connection I’ve had previous to this was 15mbps down, but mostly I’ve been stuck with 6mbps down connections, and so to have five times the speed that I’m used to is pretty amazing. I have to admit to giggling like a little kid as I downloaded a server backup while watching a YouTube video and grabbing the latest version of Ubuntu. Let’s just hope it is stable, and in a few months, I’ll be singing their praises. Honestly, if you are looking for a good Internet connection, you probably can’t go wrong with Storm or Teksavvy. Yea I’ve been pretty happy with Teksavvy so far here in BC. Customer support seems to be pretty good whenever I had a problem and download speeds are relatively stable and fast. Far cheaper than shaw cable offering even though they use Shaw’s infrastructure. No download cap and other shits that’s Rogers gives. It is one of their residential Cable Internet packages. 28/1 unlimited.